Have I mentioned before how much we LOVE living on the beach? 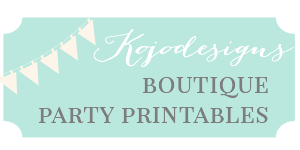 It is such a fun experience, and one that I never imagined we’d have. We love falling asleep to the sounds of waves and waking up to the beautiful water. The best part is that we have a wonderful (HUGE) playground for our girls at all times. My favorite activity is beach combing. You would think that after a couple years of living on the same beach, collecting shells would get old… but nope! It seems like every time I go for a walk on the beach I come home with a handful of new shells. The struggle is real people. 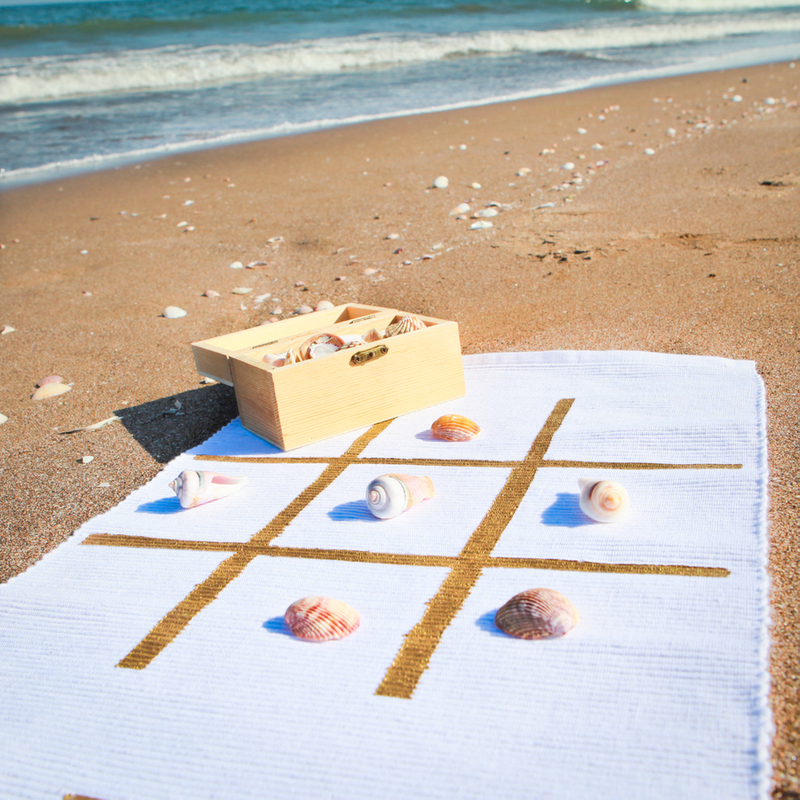 I have been brainstorming and scouring the internet for ways to put my shell collection to use, and I finally came up with a super fun idea- a giant outdoor classic game board! 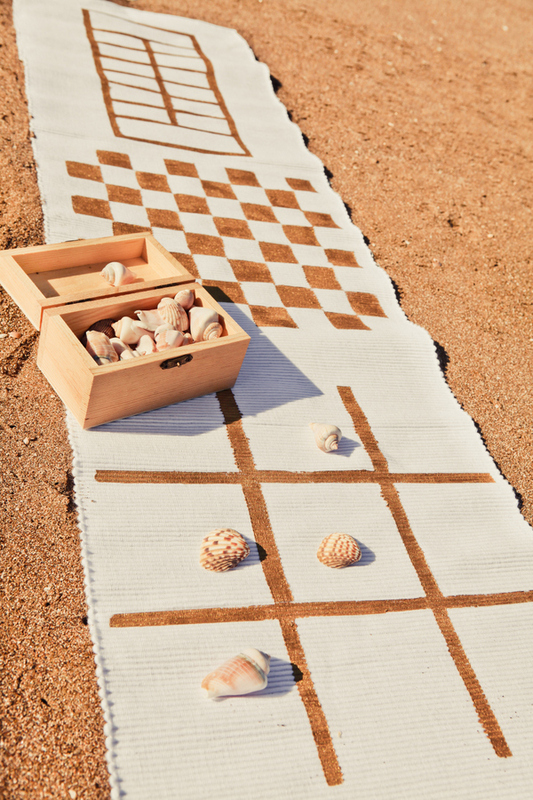 Thankfully for you, you don’t have to live on a beach to make one of these fun mats. You could use anything as your game pieces- shells, sea glass, rocks, pine cones, sticks, pebbles even flowers! 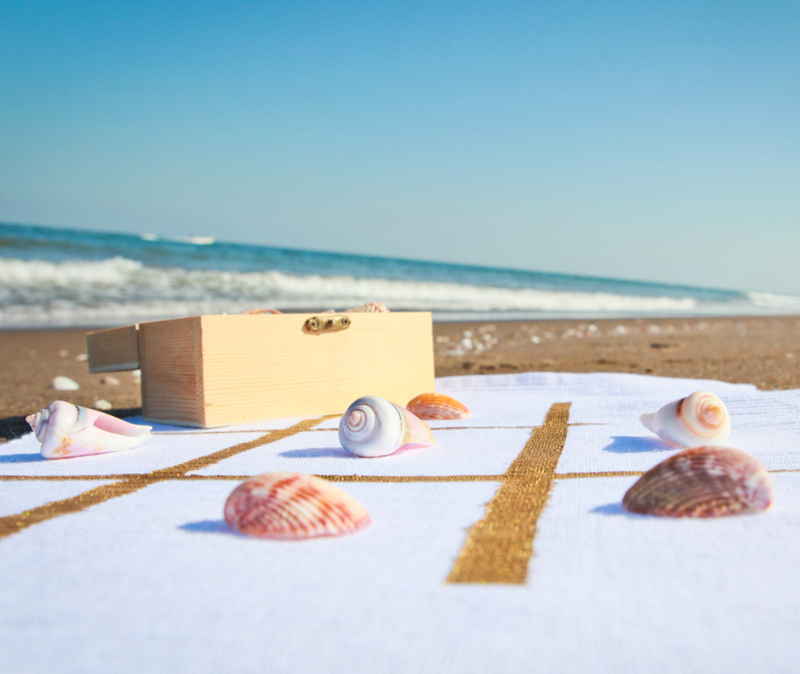 However, if you happen to be headed to a beach anytime soon and like to collect shells but wonder how to use them, THIS is your super fun solution! I picked Tic-Tac-Toe, checkers, and mancala as my three games because I wanted different levels for all ages (of course, you can choose any games you like). Here is the wikipedia list of traditional board games to get ideas flowing. 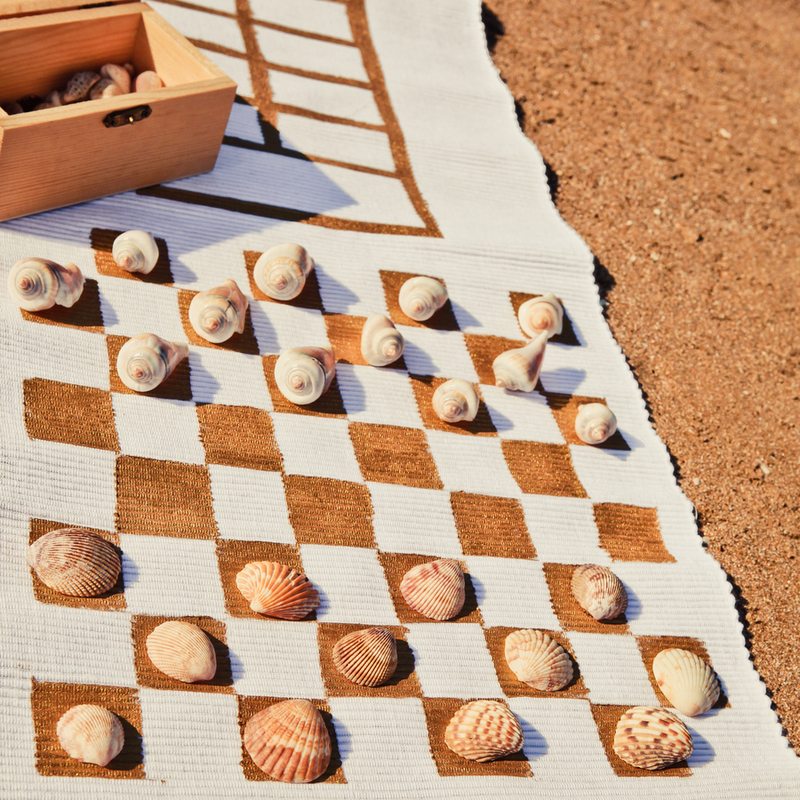 Wouldn’t it be fun to put together a whole chess set out of different types of shells? Using a pencil to lightly mark the sections, measure and section off three even sections on your table runner. Dab your sponge brush into the paint, and then paint onto the taped off areas, lightly and evenly. Allow to dry and paint on another coat. I did three coats with the gold, just to make sure it was bold and evenly painted. Once the last coat has dried, remove the duct tape. You’re Done! 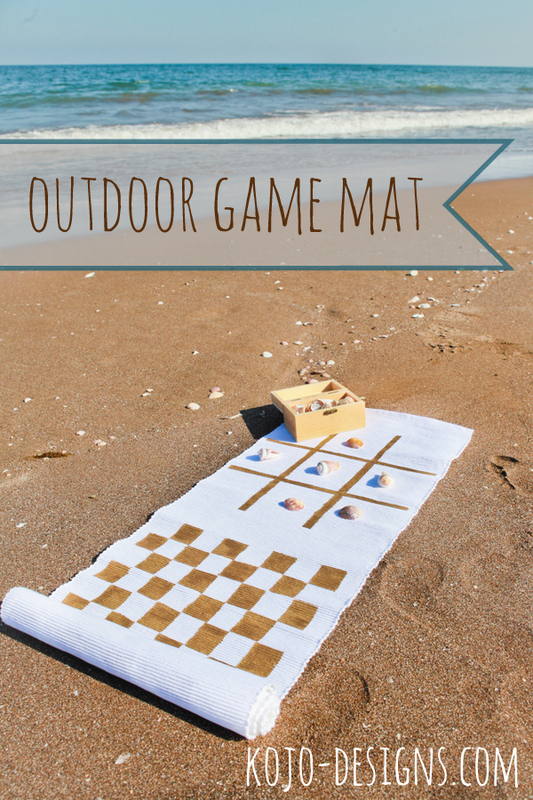 Another fun idea for this mat- throw it in the car next time you go to the park, beach or camping. Make the first game a nature walk and have your kids (or, if you love collecting like I do, you can do this part) collect all the game pieces from nature. That way the game changes every time to match your surrounding AND you don’t have to keep up with a collection of ‘pieces.’ Hopefully your family loves this giant game board as much as we do!